Integrated motorized tensioned screen without casing. This screen has been developed for professional installation, where the casing is not required. Easy to install with installation brackets into the sides, is a screen that can be placed on wall or on ceiling in almost every spaces. Basic Tensio can count on the CTS (Constant Tensio System), which ensures the constant self-tensioning of the screen by means of two counterweights hooked onto hinges placed at the end of the screen lower bar, devised for tensioning rigid cables threaded through lateral eyelets. 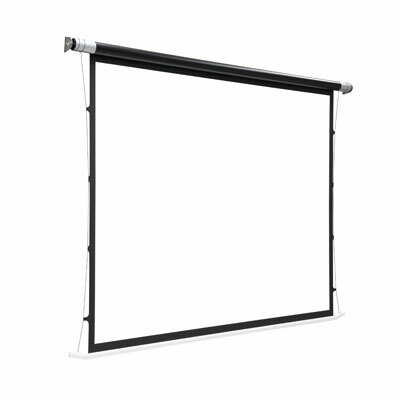 The screen can be supplied with standard motor or in RI version, with all surfaces available for motorized screen version and in version tensio all white.